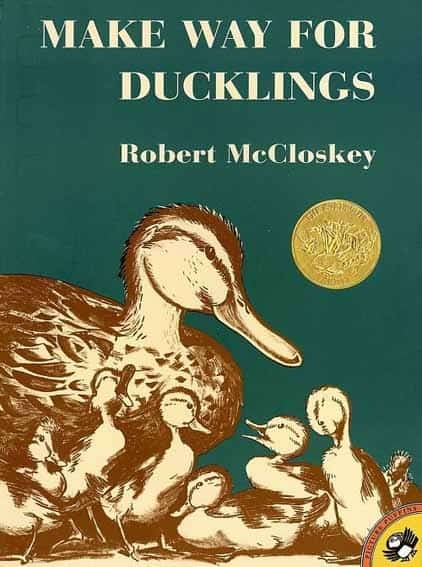 Make Way For Ducklings by Robert McCloskey is an American classic which serves as an excellent example of unreliable narration in picture books. McCloskey’s devotion to mimesis reminds me of the lengths the Hayao Miyazaki studio goes to when animating naturalistic movements. Many people know Make Way for Ducklings, but they might not know the lengths to which Robert McCloskey went to get the beloved Mallard family to look just right. […]Itching to begin the illustrations, McCloskey went down to the Washington Square Market, bought a crate of ducks and brought them back to his Greenwich Village studio apartment. He washed the ducklings off in the bathtub, put them in a pan and got to work. [A] critic has positively commented on McCloskey’s use of page breaks as a pacing technique. McCloskey’s use of one-sentence pages forces the reader to quickly turn the page, enhancing the sense of motion, especially during the home search and when Mrs. Mallard teaches the ducklings their basic skills. McCloskey also employs this page break method to heighten surprise. When searching for a home, Mr. and Mrs. Mallard seem to have found a home on page eleven. In this picture book, McCloskey’s first, it did not go unnoticed by certain critics who understood story structure very well, that this part of the story is left out altogether. One critic says the “loosely plotted” story gives no true explanation for why Mr. Mallard leaves the island in the Charles River or why the Mallards did not simply stay on the lagoon island in the first place and avoid the bicyclists on the shore. However, McCloskey has stated himself that he thinks of himself as an artist who writes children’s books and not vice versa. One critic also find the characterization lacking, that is, the Mallards represent “rather stereotypically concerned parents”, often showing the same facial expressions and rarely showing expressiveness. The moral of the story is that you can break the rules of story structure, but if you do, people will say it is ‘loosely plotted’ and if you don’t give your characters a ‘need’, your characterization will be described as ‘lacking’ and you’ll end up explaining that you’re really more of an illustrator than a writer anyhow… The other part of this story is that you can still win a Caldecott medal for your subpar storytelling efforts. ‘Come along children, follow me,’ says Mrs Mallard, swimming across the pond to the highway. This is where the anthropomorphised mother duck becomes more ducklike — in real life we sometimes see mother ducks leading their ducklings into perilous, built-up areas for what seems like no reason. And no reason is given here, hence the accusation of ‘weak characterisation’. The mother duck wants to cross the road, and so she does. Whereas the bulk of the first part of the story is illustrated from a bird’s eye view, now we see the enormous 1940s vehicles from the ducks’ perspective on the ground, and they look terrifying. The battle is represented with the ‘HONK! HONK!’ coming out of the cars. These drivers have no time for ducklings, and it’s only a matter of time before some driver comes along happy to mow them down flat. In picturebooks there is always an ironic gap between the pictures and the words; if there were no gap at all the picturebook is no longer a picturebook but simply an ‘illustrated story’. Some of the purest examples of irony are found in children’s literature, which often needs to allow a child— or the child’s proxy, an animal — to see the world through limited eyes, while alerting the older reader to this limitation. In Robert McCloskey’s Make Way for Ducklings, Mr. and Mrs. Mallard are trying out the Boston Public Garden for their new home, when a swan boat (a boat made to look like a swan but actually powered by a pedal-pushing human pilot) passes them. Mr. Mallard has never seen anything like this before. McCloskey falls naturally into free indirect style: “Just as they were getting ready to start on their way, a strange enormous bird came by. It was pushing a boat full of people, and there was a man sitting on its back. ‘Good morning,’ quacked Mr. Mallard, being polite. The big bird was too proud to answer.” Instead of telling us that Mr. Mallard could make no sense of the swan boat, McCloskey places us in Mr. Mallard’s confusion; yet the confusion is obvious enough that a broad ironic gap opens between Mr. Mallard and the reader (or author). We are not confused in the same way as Mr. Mallard; but we are also being made to inhabit Mr. Mallard’s confusion. Free indirect style describes a type of third person narration that slips in and out of a character’s consciousness. It’s like, half narrator writing, half character’s thoughts. The Wolf’s Story: What Really Happened to Little Red Riding Hood by Toby Forward, an example of a picture book in which the pictures tell a different story. My Cat, the Silliest Cat in the World by Giles Bachelet — the words tell a story about a cat but the pictures show that the ‘cat’ is actually an elephant. This is a book with a very specific, real-life setting: Boston’s Public Garden. These days there’s a statue there in honour of this best-seller. What was going on in the world at this time, particularly in Boston? Well, everywhere war was about to break out. That was the main worry. That didn’t stand in the way of much building going on in Boston at the time: museums, universities, landmarks. The city itself had a population of 770,816 in 1940. When Mr. Mallard leaves on questionable purpose, Mrs. Mallard is charged with raising their ducklings alone. McCloskey portrays Mrs. Mallard as a capable woman who does not need the support of a male character. This strong portrayal has led one critic to label the book as “pre-feminist”. Robert McCloskey is exceptional in being a recognized author [as well as an illustrator]. (He wrote Homer Price and Centerburg Tales.) The broad humor and short but strong story-lines of his Make Way for Ducklings (1941) and Blueberries for Sal (1948) have kept these two cheerful books popular through the decades. The text of Time of Wonder (1957), a description in words and pictures of a vacation in Maine, is possibly a shade overwritten, but this is a lovely picture book, full of light and air and water, and with a sense of wonder that justifies the title. At the time of writing, unfortunately, McClosky has published nothing for 30 years. Of course, McCloskey has since died (2003, age 88) so I don’t think we will be getting any more picture books out of him after all. It is interesting that some picture book creators do all of their work while relatively young, retiring at the age any other workers have done in the past few generations at around age 60; others work their entire lives, perhaps entering the very young picture book market again when grandchildren come into their lives. James Wood compares Make Way For Ducklings to What Maisie Knew by Henry James (also made into a movie). What happens when a novelist wants to inhabit a character’s confusion, refuses to make clear what a state of nonconfusion would look like? We can walk in a straight line from McCloskey to Henry James. There is a technical connection…between Make Way For Ducklings and James’s novel What Maisie Knew. Free indirect style helps us to inhabit juvenile confusion, this time a young girl’s rather than a duck’s.